Today, we’re excited to announce Split’s free Feature Flag Edition. This new offering allows product and engineering teams to integrate enterprise-grade feature flag technology into their software development cycle at zero cost. Feature flags separate code deploy from feature release, safely executing continuous delivery at scale. As a result, feature flags have become a best practice of modern development teams looking to respond faster to changing market conditions and shift toward a Continuous Delivery model. In the last few years, feature flags have moved from a tactic of the few to the norm adopted by the many. Additionally, feature flags create a foundation for online experimentation by tying measurement to flags. With this focus on feature flags, we’ve seen a few consistent trends – open source libraries are never feature-complete, and home-grown solutions require continued investments and inevitably become abandoned and a debt-laden technology. We started Split to combat these trends, making a technology that would allow customers to gradually and safely release new features (through feature flags) and provide data-driven product decisions (through feature experimentation). Feature flags are a foundational technology of the Split Platform Edition. The Feature Flag Edition delivers on one of our earliest goals – provide a free feature flagging solution allowing teams to focus not on building a flagging framework, but on building their features and their business. Split’s Feature Flag Edition lets development teams deploy feature flags into their application and software development cycle within minutes by integrating one of Split’s ten SDKs and simply using an if-else-if block in their application. Split’s feature management console in the cloud decouples the dependency on engineers, allowing both engineering and product teams to manage their feature flags through one centralized application and control each feature flag with granular targeting. Utilize Split feature flags with multiple treatments (beyond simple on/off) to target customers and segment directly, target customers based on attributes, target based on feature flag dependencies, or leverage Split’s kill switch to lower the bar for production readiness and de-risk any feature release. 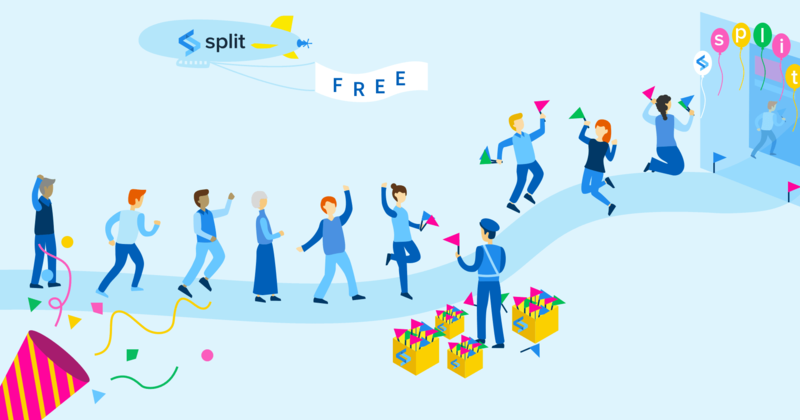 Whether you are looking to use feature flags for phased rollouts or general feature management, you can now do so free of charge with Split’s Feature Flag Edition. Create your account at www.split.io/signup and launch safely for free!